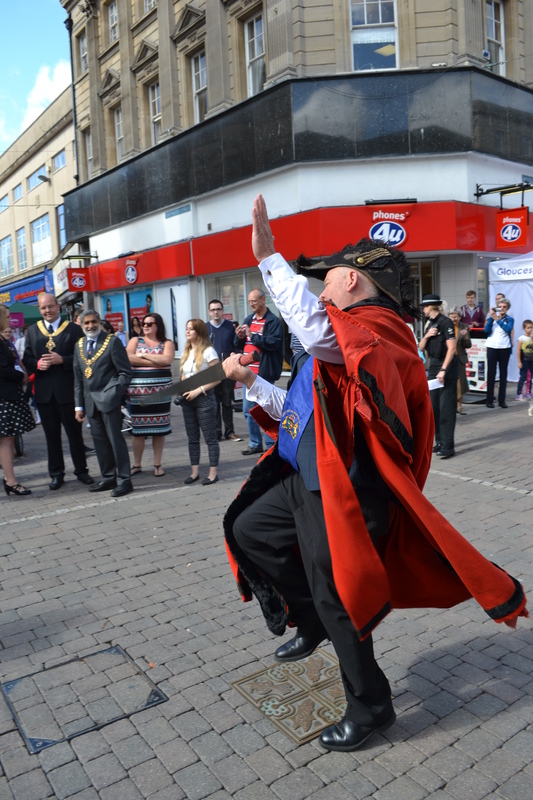 It is delightful to play the fool occasionally, so reads the motto of the revived Mock Mayor of Barton. How appropriate! Land use around train stations in the UK is always less than promising. Only a handful of cities and towns can boast a good vista from the station. Gloucester isn’t one of them! The buildings around both train and bus station are no great advert for much of the beauty and fine architecture that can be found in the city: hideous concrete slabs, boarded up windows and row after row of charity shops and cheap shops. There must have been some nice architecture there…perhaps the war removed it, but the post-War did much to ruin it. So it might seem strange that a city which appears to be going through a patriotic revival ignores this part. Ho hum..a few streets in of course and we enter the Gloucester of the postcard, but it’s a shame our post war architects could not have been more imaginative, but I digress. 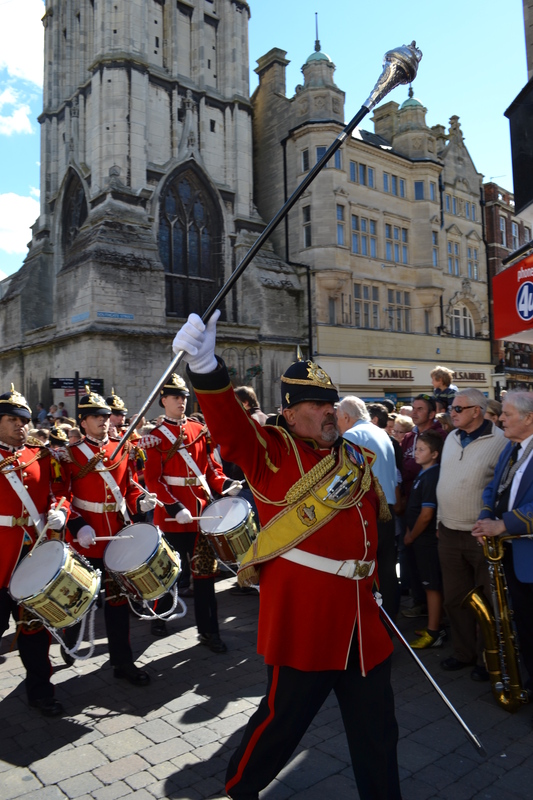 Gloucester Day celebrates the lifting of the 1643 Siege of Gloucester, when the city survived after an onslaught of the Royalist forces in the first English Civil War. Strangely despite celebrating what could be conceived an anti-Monarchist event, the custom survived until around the nineteenth century. 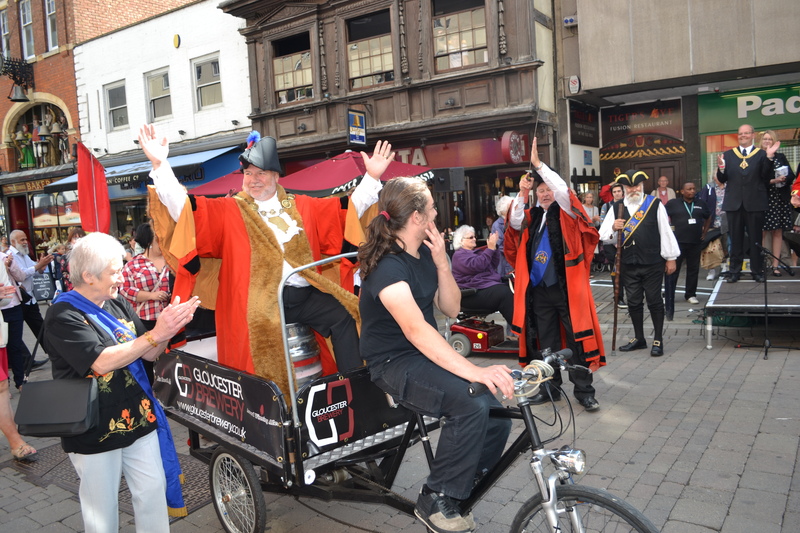 It was arrived in 2009 by the colourful figure of Alan Myatt, the Town Crier and forms part of the Gloucester History and Heritage Week. “shoot ducks, fowls, donkeys, pigs, or any game whatever, or fish in any river, running stream, ditch, pool, or puddle, with many other pains also”. Another member was inducted because he sowed soot to grow chimneys and another setting up a expensive fenced in piggery forgot to include a doorway! Interestingly, it is reported in the Gloucester Standard of c.1889 – 90 that despite the mockery of the position, some notable individuals became mayors such as a solicitor, the editor of the Gloucester Journal, a Russian Consul, and a timber importer and indeed once the City Mayor at that of Barton were one and the same. What caused the custom to disappear is unclear, but it probably considering its association with hostelries became associated with drunks and antisocial behaviour. If one parade was not enough wait a few hours and another, larger one comes along at 2.00. This was the Gloucester Day parade. 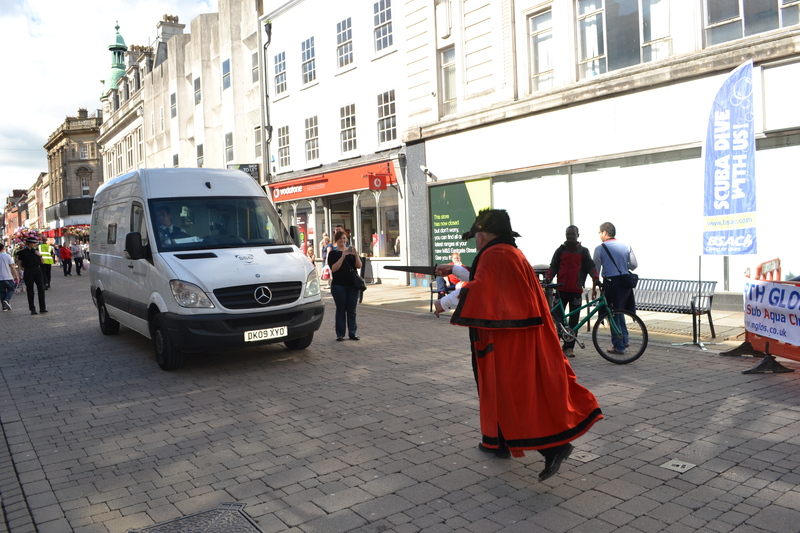 Back with the Mock Mayor, minus the Morris who congregated at the cross road near St. Micheal’s Tower, ready to dance as the group went by. These parades appear to have a formula:civic dignitaries + religious groups/Scottish bands+~ knights or Romans to its credit Gloucester’s parade added a bit more to this formula including cross dressers from the gay community, masons, a giant pig, those goats again, the Waits a revived medieval group of musicians, as well all lead by the town crier. I didn’t notice the Gloucester flag much touted from a few years back, but it was a flurry of colour and a barrage of beats. 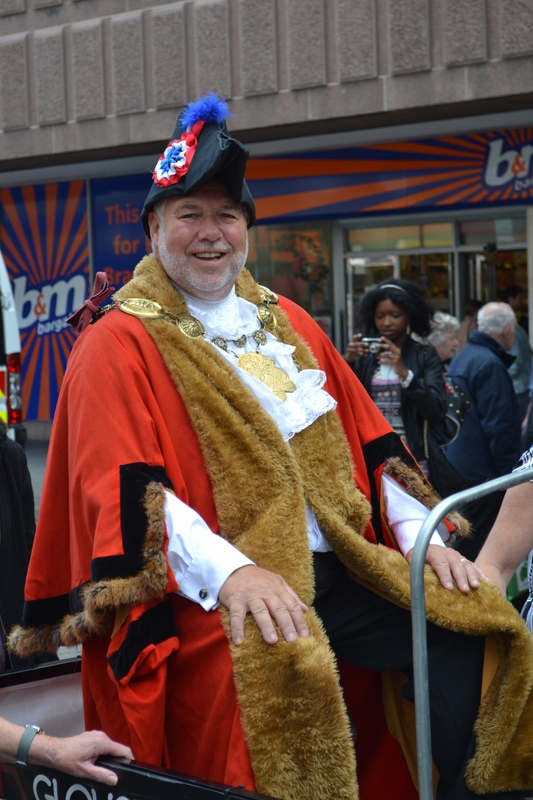 Perhaps not as comical as the mock mayor procession…but well worth a few and where else do you get two processions a day! This re-instated custom certainly is impressive and undertaken which such enthusiasm it difficult to believe it is only been revived since 2009!